On CNNMoney.com's list of the best places to live in 2010 the city of Pleasanton Ca is number 63. in 2009 Forbes also named Pleasanton as one of. "America's top hometown spots" in are United States. 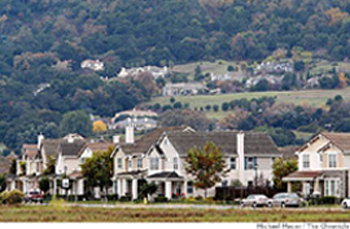 If you’re thinking of relocating to the city of Pleasanton Ca it has all of what you are looking for. Pleasanton Public Schools are Top-Rated GreatSchools.org rates Pleasanton’s schools a 10 out of 10 score. Newsweek ranked Amador and Foothill midst the top 400 high schools in the nation. 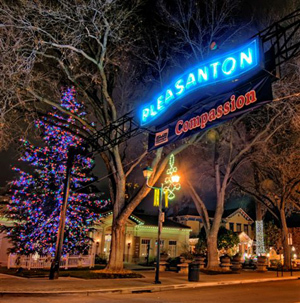 Downtown Pleasanton is the heart of the city of Pleasanton Ca. Every Saturday Farmers market, Alameda County fairgrounds, Fire and arts center, First Wednesday celebrations, main street is blocked of and it turns in to a block party. In the city of Pleasanton Ca another downtown association tradition Friday concerts in the park every Friday from June until September different local bands perform. Starting In 1980 city of Pleasanton Ca experienced a huge economic boom mainly due to the development of a number of business parks. The city of Pleasanton Ca biggest of which is the Hacienda Business Park. The city of Pleasanton Ca has drawn a number of corporate headquarters, such as Safeway, Polycom, ross stores, oracle, Shaklee, e-loan, Jp Morgan, chase, and Washington mutual. Campus is included Oracle Safeway Kaiser and At&t. other companies with main operations in Pleasanton contain Symantec, applied Bio systems, Cisco Systems, BMC software, Clorox, Sage Software, Roche. The city of Pleasanton Ca is home to the Stonebridge shopping center is a full scale mall, and there are countless other shopping centers. Downtown Pleasanton is dynamic and showcases an assortment of restaurants, casual, fine dining, outdoor dining and ethnic. Adjoining are boutique specialty stores and service businesses. In the City of Pleasanton Ca, many neighborhood parks are located within ½ mile of the residential neighborhoods they serve, which is a goal in the City’s General Plan. 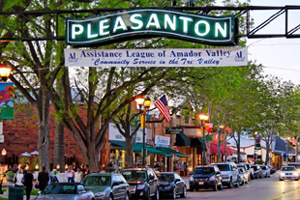 City of Pleasanton Ca features 42 community and neighborhood parks. and 24 miles of hiking trails Click here to view Parks and trails. The City features a 104 acres Sports, Augustin Bernal Park, a 237-acre natural jewel in the park system. BMX Facility on Stanley Blvd, Shadow Cliffs Regional Park contains waterslides a sandy beach for swimming, fishing and recreational boating. The park is also a popular picnic spot. For a list of park locations and amenities, click here.